I've been working on a few more gifts this week, but decided to make something for myself as well in the mix :) I've had this hat planned for ages and just never cast on, so now it is in the works! This is the Rosie Hat pattern from the Knit Lab: Hats Four Ways Class on Craftsy and I'm making it in Cascade 220 Superwash in Ruby. I watched the actual lesson about this hat a few weeks ago, but I didn't start it until this past Sunday. I got 2.5" in before I realized that I never went up a needle size! The printed version of the pattern I have is old and I guess it's been updated since I printed it because my pattern didn't say when to change to the size 8 needle (it's after the ribbing), but the class did. So, I took a photo of it before ripping it all out yesterday. Sniff. Oh well, at least I noticed before I finished it and it was too small. That's it for me this week. 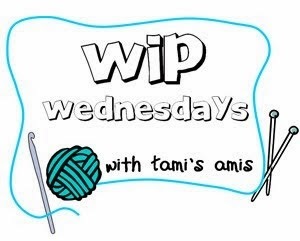 To see what others have in the works, check out Tami's Amis' Blog!